새해 복 많이 받으세요! Today is the Lunar New Year, or Seollal (설날), in Korea as well as most of Asia. Our 12-day tteokbokki sauce recipe countdown has come full circle to Gungjung tteokbokki, which is the royal Korean court version of tteokbokki. 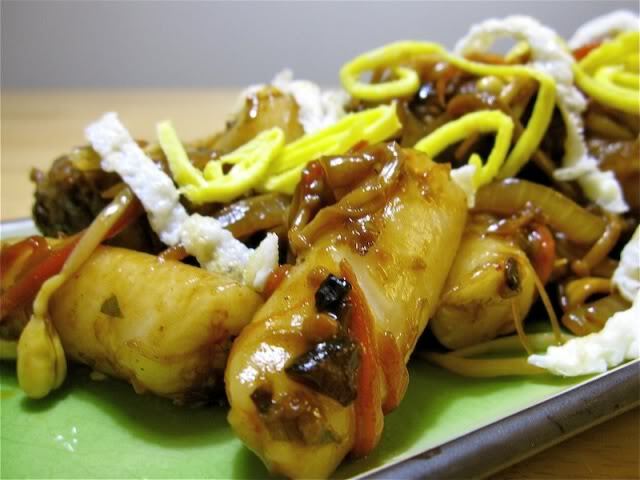 Thanks to the Korean TV drama Dae Jang Gum, this dish has become well known all over Asia. Gungjung tteokbokki was a special dish served in royal and noble households back in the days of the Joseon (Chosun) dynasty (1392–1910) on celebration days like the Lunar New Year or during ancestral ceremonies. The dish that people commonly call tteokbokki today with the fiery sauce and fish cakes is a modern, simplified version of this recipe. There are several Gungjung tteokbokki recipes on the internet. The one most easily accessible to most Americans is posted at Chow, which is the basis of the recipe I made. If you want a downsized version, check out BlogCatalog. This is the only tteokbokki recipe in which the garae tteok (가래떡) — the fat cylindrical rice noodles traditionally used in tteokbokki — are boiled beforehand and mixed in with the other ingredients quickly at the last minute. Also notice the additional layers of flavor not seen in some of the other recipes, particularly marinating the meat and mushrooms separately before combining with the other ingredients in the final sauce. There are two schools of thought on the egg garnish that I decided to use in this recipe. One school says to separate the egg yolk from the white and fry them separately, allow to cool and cut into thin strips, which is the version I use here. The other school says to separate the yolk and white, make the thin omelet and cut them on a diagonal to create diamond shapes. I had great difficulty cooking the white just right without browning it. Practice will make perfect, someday. There is one main difference between my version and the Gungjung tteokbokki recipes you will find online or in popular Korean cookbooks. The recipe books recommend using bulgogi type beef. I used ground sirloin in my recipe. I mixed the beef and the shiitake mushrooms in the recommended marinade and let them soak up the marinade for over 10 minutes. Then I formed the ground beef and mushrooms into tteokbokki-shaped meatballs or sausages. Mince the garlic and place all the meat and mushroom seasoning ingredients into a medium mixing bowl and mix well. Let stand ten minutes before adding the meat and mushrooms to the meat and mushroom seasoning mix. Mix until throughly combined. Let stand an additional 15-20 minutes. Shape the meat into tteok-sized sausages. Bring a pot of water to a full boil over high heat. Add the rice cake and boil for one minute. Remove the rice cake from the pot and rinse immediately in cold water. Discard the boiled water. Brush the rice noodles with sesame oil. Pour yolks into a hot oiled pan in a thin layer (tilt pan back and forth to cover bottom of pan). Cook the yolks over medium heat until top is just firm but bottom is not browned. Flip and cook 15 to 20 seconds. Remove from heat and let cool. Cut the cooked yolk into thin strips about 1/8 inch wide by 1 1/2 inch long. Repeat steps 7 through 10 with the egg whites. Place all ingredients for the Gungjung sauce into a bowl and mix well. Lightly coat a stir fry pan with cooking oil and heat over medium to high heat. Add beef and mushroom mix to pan and cook on all sides until they are completely cooked so they will hold their shape. Quickly add all other vegetables and stir fry 30 seconds more. Reduce heat to medium, add Gungjung sauce and the garae tteok, and simmer 10 minutes. Garnish with egg strips and nuts then serve. We have taken tteokbokki around the world and back again. I hope you appreciate this very versatile rice noodle and come up with your own creative ways of cooking it for yourself.